According to its GitHub README, Hugo is a static HTML and CSS website generator written in Go. It is optimized for speed, ease of use, and configurability. Hugo takes a directory with content and templates and renders them into a full HTML website. Hugo relies on Markdown files with front matter for metadata, and you can run Hugo from any directory. This works well for shared hosts and other systems where you don’t have a privileged account. Hugo renders a typical website of moderate size in a fraction of a second. A good rule of thumb is that each piece of content render in around 1 millisecond. Hugo is designed to work well for any kind of website including blogs, tumbles, and docs. I was interested with Hugo, simply because it distributed the *.deb package. I use Debian, so it makes me easier to install it. And even better it doesn’t pull any dependency, not even the Go compiler. So, it keeps my setup simple. The other SSG are based on things I don’t understand, which needs to setup a lot thing like node.js, ruby, and other things I don’t understand. I don’t have a time to learn them. So, Hugo is perfect SSG for me. The unintentional advantage, Hugo is really fast at building website. Well, it’s actually available on Debian repository since Stretch. But the package version is too old. Most of Hugo theme reqires higher version of Hugo. So, I went to its Release Page on GitHub to get the higher package version in *.deb format. Installing package outside the repo is actually unrecommended, but Hugo doesn’t pull any dependencies. So, if something goes wrong, I just need to remove Hugo, other packages will not be affected. Fortunately, until now I never had any issue with the sideloaded Hugo. After I downloaded it, I installed it using dpkg. I hosted my blog on GitHub. So, I made two repositories on GitHub. One to host the generated html. I named the repository addy-dclxvi/addy-dclxvi.github.io. It had to be <username>.github.io, to make it instantly accesible from https://<username>.github.io. And one more to put the source code to keep the spirit of Open Source. I simply named the repository addy-dclxvi/blog. The repo of generated html had to placed in public folder. The official Hugo guide asked me create git submodules, but I didn’t do it. I didn’t want things to be complicated, I want simplicity. Then I told hugo to create a new website. Then picked a theme from Hugo Themes. I was interested with Jane by Xianmin. So, I installed it. 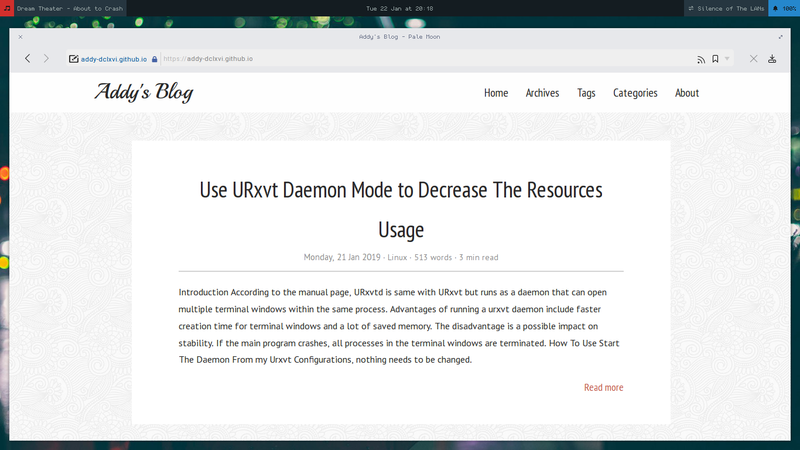 Then I edited the new article in posts/automatically-generate-openbox-menu.md. After writing some sentences and saved it. I opened a web browser to access http://localhost:1313/. I decided not to edit anything in theme folder. 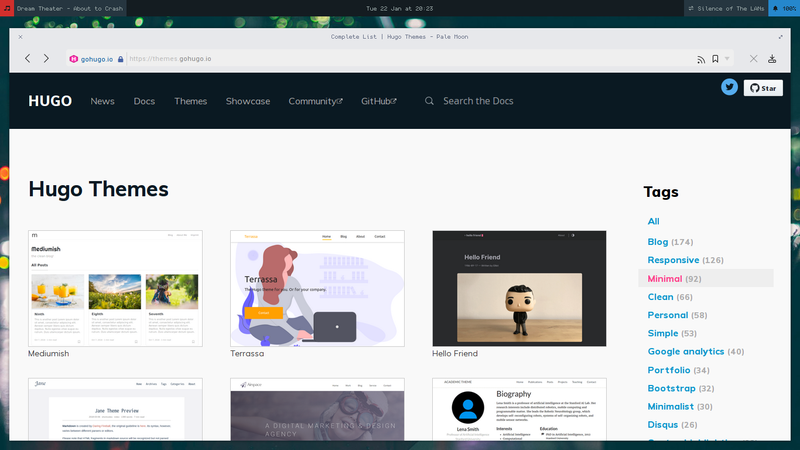 So, if the theme was updated, no need to worry about files being overwritten. I customized the visual using ~/.blog/static/css/custom.css file. I Stopped the Hugo daemon. Then build the website using hugo command. I add public folder to .gitignore, in the blog repository, because the source code repository don’t need the generated html.